course update | Linda E. Ross Property Management Inc.
We have over 20 years of experience in Property Management as well as an extensive background in the development of multi million dollar townhouse sites, new single family homes, and in the design, renovation, and restoration of existing homes. We also do extensive work across Canada as consultants for the many aspects of developing and managing Housing. Although this course is specifically designed for First Nations Members living On Reserve/Settlement/Treaty Lands, there are tips for those moving to Urban or Rural settings. As of March 2019, over 200 First Nations’ Members have graduated so far from the “A Course to prepare for Home Rental Or Ownership on First Nations’ Lands” and that over 50 Housing managers have graduated from the “Course to Train Housing Managers on First Nations’ Lands”. 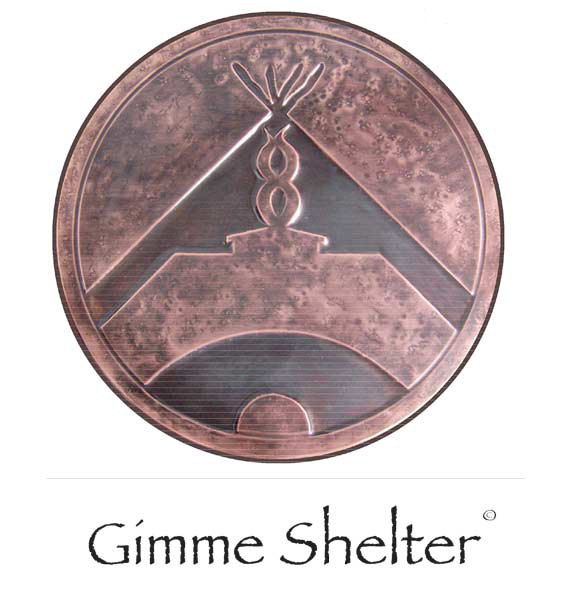 Gimme Shelter has also graduated 3 Trainers that are now able to provide the Gimme Shelter training to their own First Nation. *NTC Tribal Council for the Housing Managers’ Course and co ordination of the Gimme Shelter Course for Home Rental or Ownership for their Member Nations. This workshop makes me so proud that First Nations are all learning together. Thanks so much for coming to our Nation. Great course for young adults just starting to move out from home. Linda’s commitment to affordable housing is evidenced by her many accomplishments, which range from the practical to the prestigious. From property management services and training workshops for housing providers to helping non-profits develop new affordable housing with her expertise as development consultant and community planner, Linda has made her mark on the affordable housing sector in B.C. and beyond. As a former CEO of AHMA, Linda also played a significant role in the transfer of Indigenous social housing to the Aboriginal Housing Management Association. We are proud to congratulate Linda on this well-deserved award. I have long admired Linda for the passion with which she has embraced community building as core throughout her distinguished housing career. Linda’s commitment to ensuring that the vision for Siem Lelum was realized is simply the latest of a long list of inspiring achievements. Mentor, role model and friend, Linda is a rocking, warrior woman! And I am so happy that Linda is being honoured in this way! Linda has worked for many years in our Indigenous community as a champion for people in many areas of social, cultural and housing programming .She has travelled with us in our canoe guiding and paddling to new destinations while learning and practising cultural protocols. Her work has enriched and empowered our communities and is a great example of reconciliation. The Kwadacha Nation (Tsek’ene) is a proud and dynamic Nation located 570 km North of Prince George, British Columbia, at the confluence of the Fox, the Kwadacha, and Finlay rivers in the Rocky Mountain Trench. The Binche Keyoh First Nation is located 25km from Fort St. James, British Columbia, at the mouth of the Binche River that drains the Binche Lake into Stuart Lake. As a Consultant for the First Nations Market Housing Fund Linda works with various First Nations across Canada Building Capacity. The Victoria Native Friendship Centre (VNFC) has hired Linda E. Ross Property Management Inc. (LER) to develop Siem Lelum (Respected House), which provides 41 units of safe and affordable residential housing for Aboriginal young parents and their children, grandparents raising grandchildren, single young adults who are working and/or attending school, and young adults who are aging out of Foster Care. Ready to Rent BC works closely with both service providers and housing providers to support people in finding solutions to their own housing needs. Building elders housing, housing policy and procedures, systems development, proposal writing, renovations. Clover Place,18 single units for Homeless singles on Douglas and Cloverdale. Learn More Analysing organizational structure; making recommendations on changes; and re writing position descriptions for Pacifica Housing. Development and construction of 21 new home including the award winning “Little Big Houses” and the administration building. Paul Merrick gifted the copyright of the drawings. Visioning session with the Nation for the Wellness Centre. Assisting friendship centres across the province to write proposals for the Aboriginal Housing Initiative grant administered by AHMA. Applied for and obtained proposal development funds from CMHC to determine the need for work place housing in Sidney and to explore the financial and create a business case for workplace housing on existing church site. The Chief and Council of the Tsawout First Nation (TFN) hired Linda to act as the acting Director of the TFN while the current Director of Operations was away on holiday. As a Consultant for the Capital Region Housing Corporation (CRHC) Linda was responsible for providing expert advice throughout the project and assistance in the development of the CRHC’s strategic plan. This included providing guidance to the Board and senior staff throughout the strategic planning process, developing materials, facilitating the strategic planning session, and creating a final strategic plan report and document for public review and presentation. Linda was asked to lend her expertise in housing management to work collaboratively with a team to review and support the development of the Nautsa mawt Tribal Council’s Home Ownership Policy Toolkit Project. The Beckley Farm Housing Co-operative hired Linda E. Ross Property Management Inc. (LER) to project manage an extensive remediation of the patio decks and the building enclosure. This involved working closely with all stakeholders, including the Co-op membership, design team, engineers, and contractors. The Underwood Family Trust has hired Linda E. Ross Property Management Inc. (LER) as the development consultants to build labour housing on Certificate of Possession (CP) Land on the Tsawout First Nation. Canada Mortgage and Housing Corporation (CMHC) has provided Seed Funding and BC Housing has provided a $3 million dollar grant towards the development of this innovative and much needed project. “I have long admired Linda for the passion with which she has embraced community building as core throughout her distinguished housing career. Linda’s commitment to ensuring that the vision for Siem Lelum was realized is simply the latest of a long list of inspiring achievements. Mentor, role model and friend, Linda is a rocking, warrior woman! Linda E. Ross Property Management Inc currently offers market, co op, urban and on reserve property management services. 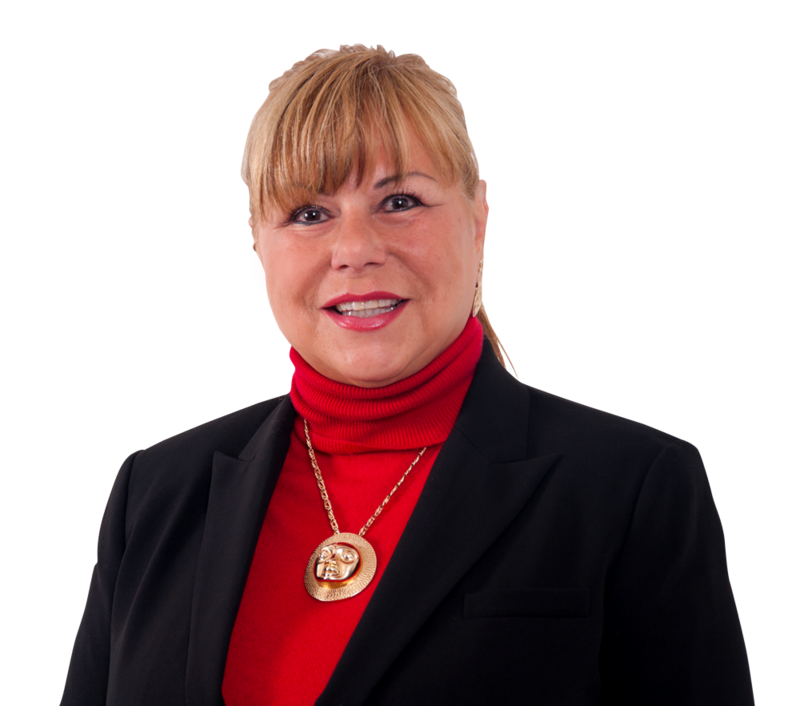 The managing Broker for this company, Linda E. Ross, has over 20 years of experience in property management, as well as an extensive background in the development of multi-million dollar townhouse sites, new single-family homes, and in the design, renovation, and restoration of existing homes. Linda was the Executive Director of M’akola Housing Group of Societies for over 11 years, and was the President and then CEO of the Aboriginal Housing Management Association for a total of 10 years. Linda also served on the Minister of Housing Advisory Committee for the Provincial Government for 9 years. Environmentally respectful products and practices. Sound management practices that are sensitive to the needs of the tenants while providing the owners with economic benefit. Best business practices to keep operating costs reasonable, while maintaining buildings in the best possible condition for long-term sustainability. Short and long-term financial planning to ensure owners are prepared for any eventuality. Along with managing the Victoria Native Friendship Centre’s social housing developments Fernwood House and Siem Lelum House, Linda E. Ross Property Management Inc currently offers market and on reserve property management services. Wayne Helgason & Linda Ross sharing a laugh with Actor, Adam Beach, at The Tsawout First Nation Gala to rebuild their Longhouse. Actor, Adam Beach, attended the Gala for the fundraiser and gave an inspirational talk to the attendees. Wayne Helgason, an active advocate for the rights of the Aboriginal peoples in Canada had known Adam when he was a youth. Linda knew that Adam was a big supporter of adequate, safe and affordable Housing for Aboriginal peoples both off and on reserve. Adam offered to help with advocacy and possibly lending his name to fundraising efforts for various projects. We are grateful to Adam and look forward to a long and fruitful relationship. 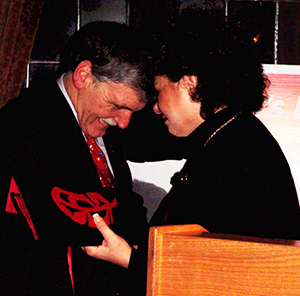 A shot of me presenting Romeo Dallaire with a feather, some sweet grass and some sage in honour of his contribution to world peace by bringing attention to the genocide in Rwanda which he calls a “failure of humanity”. He is the author of the book: Shake Hands with the Devil. As a graduate of the University of Manitoba and the mother of an Aboriginal young man, this apology has a profound impact on me and my family. I am very proud of my Alma Mater for taking responsibility for the role they played in this dark part of our history in Manitoba. We invite you to join us in supporting ĆENENITEL, the emergency fund for Aboriginal education students at Camosun College. The fund is intended to provide much-needed relief in times of unforeseen financial difficulty for students in Aboriginal education programs. Please support those striving to improve their lives through education. It’s as easy as visiting the Camosun College Foundation and making your donation online (please include notation of this fund) or by calling (250) 370-4234.